Who would kill a hundred-year-old man at his own 100th birthday party? That’s what cupcake truck owner Isabel Addington is left asking herself when she’s hired to cater a birthday party where the guest of honor dies before he can even taste her cupcakes. But it’s none of her business. She needs to focus on preventing her abusive husband from finding her and on keeping her struggling food truck afloat. When the police declare the dead man’s death a murder, neither of those goals seem likely. Her fingerprints were all over the murder weapon…if you can call a bottle of ketchup a weapon. Now the woman who hired her is refusing to pay, a nosy reporter is putting her true identity at risk of discovery, and the dead man’s handsome grandson wants to prove she killed his grandfather. Her future holds either a casket or an orange prison jumper unless she can find out who really went to all the trouble and risk of killing a hundred-year-old man. 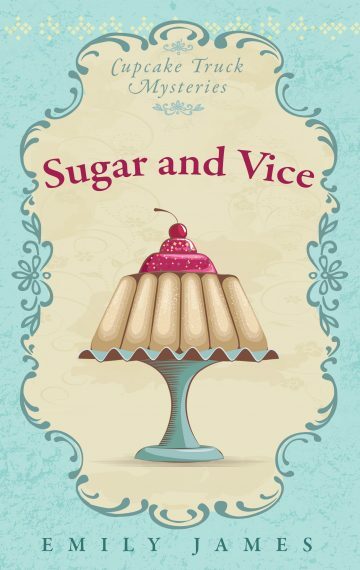 Sugar and Vice is the first book in Emily James’ Cupcake Truck Mysteries.